Today's Prompt: Having a positive attitude is important . . . but let’s face it, diabetes isn’t all sunshine and roses (or glitter and unicorns, for that matter). So today let’s vent by listing ten things about diabetes that we hate. Make them funny, make them sarcastic, make them serious, make them anything you want them to be!! 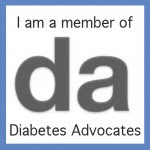 There are a lot of things I hate about diabetes. A LOT. Right now, I'm coming of off a wicked low of 55. For me, anything below 60 is not pretty. I'm so mad right now. I should be in bed, but diabetes had other plans. Rather than sleeping, I'm up late writing this post. Instead of a list of the ten things I hate most about diabetes in general, this is a list of the ten things I hate the most about diabetes right at this very moment. 1. I hate that I had to put off writing this post because of the low. 2. Diabetes, I hate the way you make me feel when I'm low. How you stop me in my tracks. My brain turns to mush and I can't function. I hate that. 3. I hate how I feel like I must eat the entire kitchen after a low like this. Why can't a juice box and a small snack be enough? Why do I go crazy and drastically overtreat? I hate that I just ate three muffins, Reese's Pieces, dried fruit, and two vanilla sandwich cookies. 4. I hate that I am now sitting here feeling tremendously guilty. Why did I just eat all that crap? Why? This was stupid, Jess, stupid! I want to cry. Why on earth do I do this to myself? Guilt, guilt, and more guilt. Ugh! 5. I hate that I am now doing some intense D math, trying to figure out how the hell to bolus for all the food I just ate. Should I round it up to an even 100 carbs? Was it more? Less? Dual wave or straight bolus with an increased temp basal to handle the fat? 6. Diabetes, I hate how you make me afraid. Because I am afraid. I've mentioned before how nighttime lows scare me more than anything else in the world. I hate that I will likely underbolus for my overtreating because I am so scared of going low at night. Yes, I have the CGM. But I am still terrified. 7. I hate how I am now officially on the glucoaster. I am. Thanks to the low and subsequent overtreatment. And thanks to my fear of going low again, I will wake up high. I am willing to bet you all my earthly possessions that this is going to happen. 8. Speaking of high, I hate how you make me feel, diabetes, when I'm high. If my beeping CGM doesn't wake me up later, my high bgs will. I hate waking up drenched in sweat. I will know instantly that I am high. The headaches, the extreme thirst, the extreme grumpiness. I don't relish starting the day in that fashion. 9. I hate how you will be the last thing I think about before I go to sleep tonight. And you will be the first thing I think about when I wake up tomorrow morning. It's the same, every day. Just once, I would like to think about something else in those moments. 10. I hate the worry that you, diabetes, cause the people who love me. It wears on them. My husband sees me sitting there, low, unable to do anything about it. He watches me struggle with the straw for the juice box before he takes it and opens it for me. He listens to my blubbering attempts to talk to him with low brain. I hate how it will make him feel when I tell him about my overtreatment tonight. He needs to know in case I start making funny noises in the middle of the night. He will be as scared about my blood sugars tonight as I am. He will watch me deal with the rebound high in the morning. He will put up with my grumpiness. Because he loves me. And I love him. And I HATE diabetes for doing this to him too. Diabetes, do whatever the hell you want with me. But leave my husband, as well as my parents, out of it. Please. Bummer on the low Jess! I hope the night wasn't too crazy. Awww, Jess. Sorry you had a crummy evening. Hope morning was much better. Hugs. ((Hugs))I hate lows, I hate you, diabetes. I go to sleep every night with the same fear. I HATE NIGHTIME LOWS! They are the worst!!! Oh, Jess, this post is so good--even though I hate what happened to give you the fodder. I hope the glucoaster has moved on by now. I know exactly what you mean by #3, 4, and 5. Exactly. Sometimes I'll try to tell myself "just the juice box, then sit. Nothing else for a while." and it doesn't work. Our brains just aren't working for us. Sigh--thank you for writing this. :( The glucoaster is not a fun ride! And I hate how diabetes makes every thing so difficult sometimes. I totally hear you on worrying about the possibility of going low, especially during the night. Hope you didn't end up going high!